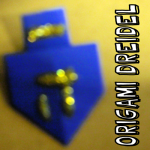 Today I’m going to show you how to make an Origami Dreidel for Hanukkah. A dreidel is a spinning top toy that is played during the Hanukkah season. Each side of the dreidel has a different Hebrew letter on it. The children will bet each other which letter will be on top of the dreidel when the dreidel lands. The winner usually wins chocolate candy called gelt. Fun stuff!! So, let’s start today’s craft. I have a fun craft for you today….I am going to show you how to make Paper Circle Ornaments for Christmas. 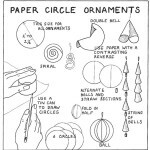 And, I’m not going to just show you one Paper Circle Ornament…. I’m going to show you five different ones. They are so creative and beautiful…. you could even decorate an entire tree with these ornaments…. how fun would that be? All of these ornaments are made of paper circles. 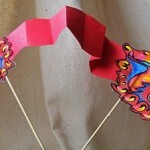 To make drawing circles easy, you can use cups or tin cans or something like this. Draw around them, as illustrated. So, let’s get started. Today I’m going to show you how to make a Paper Star Ornament for Christmas. This ornament is not any ordinary paper ornament…. 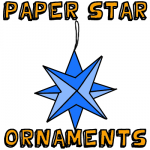 the paper star ornament comes out looking crisp and beautiful. 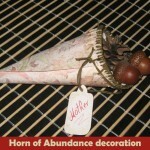 Make a few to decorate your Christmas tree this Christmas season. You can even use colored paper to make each ornament a different color. 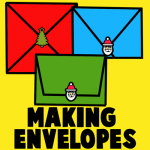 Today I’m going to show you three different ways to make your own Envelopes for the Christmas Holiday. Everyone loves to receive homemade drawings and paper gifts for the Holidays. 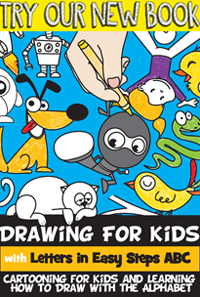 But, instead of just handing them the drawings…. how about make your own envelopes to place them in. 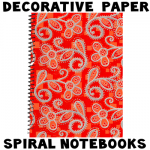 You don’t have to stick to the ordinary white paper envelopes either… Instead make many different envelopes out of different color paper. 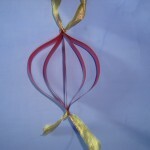 Today I’m going to show you a simple craft to make a Christmas Ornament out of paper and ribbon. And, keep in mind…. just because the craft is a simple one does not mean that the ornament will look simple when done. As a matter of fact, the ornament turns out to be quite beautiful. So, let’s get started. 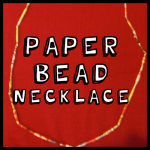 Today I’m going to show you how to make a Paper Bead Necklace. Believe it or not the beads are made out of magazines and glue, but you would never know that by looking at the finished craft. The finished Paper Bead Necklace turns out beautifully. Beautiful enough that you could give it as a gift this Holiday season. Or, keep it for yourself…. the choice is yours.